Due to maintainance all clients and servers will be rebooted on 4.3.19 at 18:00 and will be unavailable for presumably 3 hours. This evening, starting at 20:30, the following services will be unavailable for approximately half an hour due to replacement of a broken hardware component: Printing in the CIP pools, login on Windows computers, cipmap.cs.fau.de, gitlab.cs.fau.de, waffel.cs.fau.de and wwwcip.cs.fau.de. This replacement should resolve the slow response times of these services, in particular Gitlab. As a small christmas present we have doubled everyone's quota. On Monday, 2018-12-03, the rooms CIP1 (01.155-113), CIP2 / develop group (02.151-113) and BibCIP (02.135) are closed from 6pm/18:00 to approximately 8pm/20:00 due to an exam taking place there. Due to maintenance of our servers on tuesday 11th of September from 16:00 all computers in all CIP-Pools will be unavailable. Update: Only VMs are left to reboot, i.e. short downtimes of individual services may still occur (windows, gitlab, printing, ...). The CIP-Computers are available again now. On Tuesday, 2018-07-17, the rooms CIP1 (01.155-113) and CIP2 / develop group (02.151-113) are closed from 9:30am to approximately 12:30pm due to an exam taking place there. Today (Tuesday, 2017-12-12) starting at 10pm/22:00, gitlab.cs.fau.de will be offline for maintainance. This is expected to take no longer than 30 minutes. Login on the computers and all other CIP services are unaffected by this and will work as usual. Due to updates of our servers on wednesday 30.08. all computers will be repeatedly unavailable on short notice. On Monday, July 31th from 10:00 to 12:00 the room 02.151 CIP2 (develop group) will be blocked by the electronic exam for Applied Visualization. During the timespan of around 9:45 to 12:15 the hosts faui00*, faui02* and faui0f* will not be available. On Monday July the 24th will be no CIP-Admin consultation hour due to a trip of chair 4. Today, 2017-06-19 from 9:00 PM we need to perform maintainance work on the computer pool. All computers will need to be restarted. We expect the maintenance to take at most one hour. There is a new version of our CIP-VPN with more modern encryption. See Documentation. The old version is still running for now. From March 1st to March 3rd all CIP servers will be moved to a different server room. Thus all CIP pools will be unavailable for that time. In addition the client hosts will be migrated to Debian stretch which will wipe the complete disk including /var/tmp. If the downtime is over earlier, it will be announced here. Starting on 1.11.2016 SSH and GnuPG keys stored in home directories will be backupped alongside with the regular CIP backup. These backups are stored on RRZE computers, not CIP infrastructure. Please delete any keys for which this is unacceptable before that date. On Monday, 2016-08-29, the CIP pools will not be available starting at 11:00 PM for up to 2 hours. The home directories will be unavailable in this time as we have to replace the RAID controller in the server storing them. Thus working is not possible on any of the computers. Today from 9pm to 10pm /proj/ciptmp will be unavailable due to maintenance work. Regular work will be possible during that time as long as ciptmp is not used. Due to an all-day training event, consultation hours for Wednesday are cancelled this Wednesday. Today, 2016-07-04 from 10pm we need to perform maintainance work on the computer pool. All client computers will need to be restarted. We do not expect the maintenance to last longer than 30 minutes. Today, 2016-06-29 from 10pm we need to perform maintainance work on /proj. All other services should stay available. We expect the maintainance to be done by 6am tomorrow morning. Today, 2016-06-01 from 10pm we need to perform maintainance works on the server faui03. Personal folders will be unavailable, working on the CIP-Pool machines won't be possible. From February 8th to 12th 2016 the room 02.151 (CIP2) will be closed for paint work. Please use any of the other CIP pools, which will be available as usual. Git-Hosting with a web interface and fancy! Redmine will be switched off on december 1st. All servers have been moved and upgraded, so everything should work as before. Should you encounter any problems, write us an email at problems@cip.cs.fau.de. In the week of August 31st to September 6th all CIP servers will be moved to a different server room and some of them will be upgraded to Debian jessie. Thus all CIP pools will be unavailable for that week. If the downtime is over earlier, it will be announced here. Due to a security update all machines will be rebooted tonight at 2100. Today's consultation hour will be held from 2pm to 3pm instead of the regular 12pm to 1pm. Due to a security vulnerability in a Linux kernel driver all machines will be rebooted tonight at 2100. Due to the network switch being replaced the Huber-CIP will be unavailable this monday from 14:00 hours until probably 18:00 hours. Working remotely on those machines will of course also be impossible. On Saturday, 2015-04-18, a planned power outage to test the emergency power supplies will take place. The CIP-Pool will be unavailable from approximately 6 to 12 AM. The first two weeks of the semester, consultation hours will be from 12:00 to 13:00 either at the server room 00.157 or at one of our CIP-Pools. The current room is always announced via a sign in front of the server room. On Friday, 2015-03-27, a planned power outage to test the emergency power supplies will take place. The CIP-Pool will be unavailable from approximately 7 to 10 AM. On 2015-03-18 the CIP will migrate to the newest version of Debian ("Jessie"). Therefore the computers will presumably not be useable for the entire day. The servers ircbox, faui01, faui06, faui0sr0 will be updated as well and therefore reinstalled. Existing crontabs will be migrated. We're offering additional consultation hours on Thursday and Friday, starting at 14:00. The location will be displayed in front of room 00.157-113 as usual. Update: The majority of the computers have been updated and are ready to use. Update: The FAQ describes some of the changes. Recently, there have been numerous unpatched security issues in the Flash Player. We're disabling the browser plugin for now. On Saturday, 2015-01-10, a planned power outage to test the emergency power supplies will take place. To avoid any damage to hardware or software, we will automatically shut down all CIP-Pool computers starting 04:00. We expect the CIP-Pool to be available again some time in the afternoon or evening. Update Contrary to previous announcements, the power supply tests and outtages will not take place on January 10th. Update #2 The power outage will be on Saturday, January 17th from 6am till 6pm. 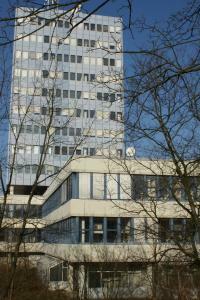 Since most of the reconstruction works will have been finished by Monday 2015-01-12, the blue computer science building (Wolfgang-Händler-Hochhaus) will be accessible outside normal opening hours with your FAUcard again starting Monday. Please mind the still existing construction sites. On October 31th we will reinstall the computers faui0sr0 and faui01 to switch the 32-bit system to 64-bit. All stored data on the machines will be wiped, this includes crontabs. Please backup your data. Unfortuantely, we've found that some of the CIP-Pool rules haven't been observed by some students. We'd like to remind you that it's not allowed to carry bottles (except water bottles) in the CIP-Pools, ask you to close all windows as you exit the room and turn off the lights. The rule about bottles includes empty soda bottles as well. The computers faui06a to faui06p, which usually are permanently accessible via SSH, will soon be temporarly unavailable as the hardware gets replaced. The computers faui00* will still be available and should be used instead. On Saturday, August 30rd 2014, starting at 10am we will move all of the faui02 services (including web services, waffel, openfaupn, git and printing, as well as parts of NFS and LDAP) to new hardware. We are hoping to be done around 6pm. On Saturday, August 23rd 2014, starting at 10am the old ircbox host will be replaced by new hardware. We'll try to migrate your crontabs, but you're advised to backup your setup and ensure everything works. The old ircbox host will be available as ircbox-old, but will be shutdown soon. On Monday, July 28 2014, starting at 20:00 /proj/ciptmp will be moved to new hardware and thus be read-only for approximately 4 hours. video.cs.fau.de will also be moved but there should be no downtime. Update The maintenance will start at 20:00 instead of 13:00 as originally announced. 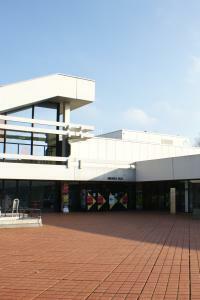 From 14th July until 17th October the computer science building including the CIP pools is closed due to building measures. Only the CIP pools on the ground floor (CIP 3 and CIP 4) and the Huber CIP are accessible, but only with registered FAU-card from Monday to Friday from 7am to 8pm. All other CIP pools are closed, however the machines are still accessible most of the time via SSH. From 18th August until 15th Septemper 2014 only the Huber CIP is accessible! For more details see the FSI-forum at https://fsi.informatik.uni-erlangen.de/forum/post/128653 and https://fsi.informatik.uni-erlangen.de/forum/post/132980. Due to the imminent closing of the building, the printer ps2acip will be available in room 00.156 from now until october. All other printers will be switched off starting tomorrow evening. Due to an important security update we'll have to reboot all CIP machines monday night at 8:30pm. Currently, some of our services are offline due to a general cooling device failure at the university. Currently, ciptmp, machines running windows and some sunray servers are down. We don't yet have any information on how long this outage may last. Update: All services are operating normally again. Tomorrow, Saturday, July 21st there will be a planned downtime of one of our file servers for about one hour, starting at 11:00. The /local directory tree and dhcp/primary dns services will be unavailable during this time. UPDATE: The reboot took place, all systems should be back online now. On Friday, 2014-05-16 Monday, 2014-05-12, starting at about 8pm, we will reboot the file server faui03 and all CIP clients. This should take no longer than 15 to 30 minutes. The CS Departement's CIP-Pool was also affected by the so-called heartbleed bug. 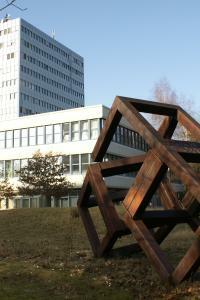 The Rechenzentrum has also published some recommendations and comments. Affected server certificates have been swapped out, all software has been updated. Redmine and Waffel each have a separate password database, you can reset those passwords on the respective websites. Your general CIP-Pool password can be reset via kpasswd. If you have set a separate service password for the aforementioned VPN or mail services you can reset those passwords via /local/bin/servicepasswd -s vpn and /local/bin/servicepasswd -s mail respectively. With /local/bin/servicepasswd -l you can check if you have set service passwords, in case you are unsure. When in doubt, reset all your passwords. For the OpenFAUpn service the server certificate has also changed. This means that you need to download the new configuration and the new certificate chain and install them. You need to do this before you use your freshly reset password with the VPN for the first time. All over the internet, lots and lots of services and websites have been affected. If you have re-used any password on any two websites or services anywhere (which we strongly advise you not to do), you have to reset all those passwords. You should also try to use separate passwords for each service in the future. When in doubt, just reset all your passwords, and set them all different. Due to the installation of new cooling devices, some of the cip services will be unavailable. ciptmp will be inaccessible until proper cooling is ensured again. Update: ciptmp is available again (at least for now, we're monitoring the temperature situation). Update: The issues are expected to last until at least Tuesday morning, but we were able to restore ciptmp service. Windows and some sunray servers remain down for now. Update2: All services are operating normally again. On Tuesday, April 1st 2014, the backup power supply will be tested, starting around 6am. The CIP pool will be unavailable during that time as a complete shutdown will be necessary. We expect the power outages to last until around 8am, and the CIP pool should be fully operational again at around 10am. Please note that this is not an April fool's joke. This Friday, January 17th, all CIP computers will be rebooted in the afternoon, starting at roughly 6pm. This Friday, December 20th, all CIP computers will be rebooted in the afternoon, starting at roughly 5pm. Additionally, the last consultation hour for this year will be Thursday, December 19th, at 3pm. This Monday, October 21th, the backup power supply will be tested, starting at 6 am. The CIP pool will not be available during this time, as we will shut down everything until the tests are over (hopefully around 10am). Afterwards we will start all systems but please note that this will take some time so not all systems will be available right away. Due to a switchover from Solaris to Linux, several longer downtimes of faui09 will become necessary this week. This will affect the directories /proj/ciptmp, /proj/cipdata and our Debian and Ubuntu mirror at debian.cs.fau.de. Backup work is taking us longer than expected, faui09 downtime will extend well into next week. faui09 is back again, therefore /proj/ciptmp and /proj/cipdata are back, too. Please let us know, if you encounter any problems. we apologize for the short notice, and hereby anounce that on friday sep 20th from 5pm on we will upgrade the last of our servers to debian wheezy. from friday 5pm til saturday the CIP pools will not be usable. we want to thank everyone for your patience, and declare the update series over. please report anything that you might find broken to problems@cip.cs.fau.de. In the next weeks there will be some disturbance in the availability of the cip-pool computers. Namely, on thursday, September 12th we will upgrade the last and most important of our servers to wheezy, so from 4pm on the CIP-Pool will be completely unavailable. One week after that, on thursday, september 19th we will shut down all CIP pools and servers for the time from 6am to 9am for rerouting of power lines in the course of including the new generator. The consultation hour will not take place. In urgent cases: contact us via mail. You will not be able to use any services that are connected to our storages. All CIP pools and other rooms from ground floor to second floor that are currently closed due to fire safety regulations will be re-open on Monday, April 15th. Due to ongoing revisement of our fire safety procedures, we hereby announce the following change in our rules. To reduce the amount of flammable material contained in a room, only non-flammable garments will be allowed henceforth. Due to various benefits to health, comfort and radiation protection we recommend, depending on your taste and weather conditions, the use of Tremolite, Carbonite or aluminum foil. Please also refrain from bringing any harmful chemicals such as Dihydrogenmonoxide to avoid the formation of flammable gasses through thermolysis. Furthermore, we would like to announce a number of openings for the exulted position of "sniffer (f/m)". Your task will be to survey the surrounding air for byproducts of exothermic reactions and initiate emergency procedures on detection thereof. Similarly, the position of "runner (f/m)" is available for sporting individuals able to cover the distance from the CS building to the Erlangen fire station in less than 10 minutes, should the diesel backup power unit and thereby the fire alarm system fail unexpectedly. Currently ongoing work to upgrade fire safety installations is scheduled to be finished by 2013-04-15. If everything goes according to plan, the CIP-Pools and lecture rooms that are currently closed will be reopened in time for the new semester. The backup power supply was repaired, so it will get tested on Wednesday, March 20th, starting at 7 am. Again, the CIP pool will not be available during this time, as we will shut down everything until the tests are over (hopefully around 9 am). The CIP pool 0.01-142 (Martensstrasse 5a, Casa Huber) is still usable (and now open for everyone), so is 02.135-113. Printer ps2ccip will stay online and is moved to 02.135-113. All other printers will be shut down. This Saturday, January 12th, the backup power supply will be tested, starting at 7 am. The CIP pool will not be available during this time, as we will shut down everything until the tests are over (hopefully around noon). During the christmas holidays (until January 7th) no consultation hours will take place. You can contact the administrators via email in urgent cases. The rooms will be accessible by our usual card lock system. Due to many sound system problems, pulseaudio was removed on all CIP systems. You now can use plain alsa. This should work with all applications out of the box. You can set the volume using alsamixer from your command line. Please let us know if you still experience any problems with sound. We changed our IPv6 address space to match the new policies specified by the RRZE. Please let us know if you should experience any problems. We migrated our Windows domain from NT4 to Active Directory (thanks to Samba 4). Nothing should change for you, but you will have to reset your password via '/local/ciptools/bin/setsambapw' from your UNIX account. Last night at around 1 am the CIP pool experienced some unscheduled downtime, causing reboots of different servers. Since 8 am everything should be back to normal. If you still experience any problems, please let us know.